A friend of mine attended the Show Biz Expo this past weekend in NYC and got one of these promotional pens in the shape of a fighter plane. The wings open and close, and the whole thing just looks amazing. I'm always intrigued by the many shapes and sizes of promotional pens, but this one has to be the winner. Unless someone else has a story to add? Design Within Reach's Bouquet of Notebooks finally arrived (they were a backorder) and they were worth the wait. 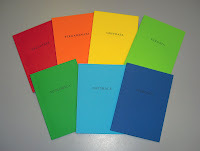 The seven pocket notebooks, about 4 x 5.5 with 40 unlined pages, are fashioned using different types of paper, the "7 senses of paper according to Fabriano." the Red notebook is Vellatutata--Velvety, and features very smooth 100gsm white paper. the Orange notebook is Pergamenata--Parchment, with white 90gwm parchment paper. Yellow is Goffrata--Embossed bright white 90gsm paper. the Light Green notebook is Vergata--Laid, an ivory 85gsm paper. Dark Green is Ecologica--Ecological, a cream colored 80gsm paper. Light Blue is Naturale--Natural, a dark ivory 85gsm paper. Finally, the Dark Blue notebook is Marcata--Felt Marked, an ivory 95gsm paper. All the papers used are very smooth and heavy, likely to withstand fountain pen ink without bleeding. The colors and paper are a treat, definitely take a look at this if you are in the market for some unique pocket notebooks. At our annual vendor fair the Staples table was loaded with swap, and among the items they were featuring was this Paper Mate Biodegradable ballpoint pen. The components are made from a corn-based material which, when planted in soil or composted, will degrade within about a year. First thing for me always is aesthetics: do I like the way it looks? The answer is yes, I love the cream and mint colors. The pen is a bit bigger than I would like barrel-wise and the 1.0mm tip as well. Overall, it looks good, writes well, and is a keeper (until I want to get rid of it, and then I won't be worried about recycling). Paper Mate's Biodegradable line also features a mechanical pencil, which a friend of mine picked up. That too looks nice and works well, so both are definitely something to think about if you're looking for green office products. The Uni Style Fit Multi-Pen takes the Uniball Signo DX ink refill and puts it into a multi-pen barrel that holds three of your favorite colors. 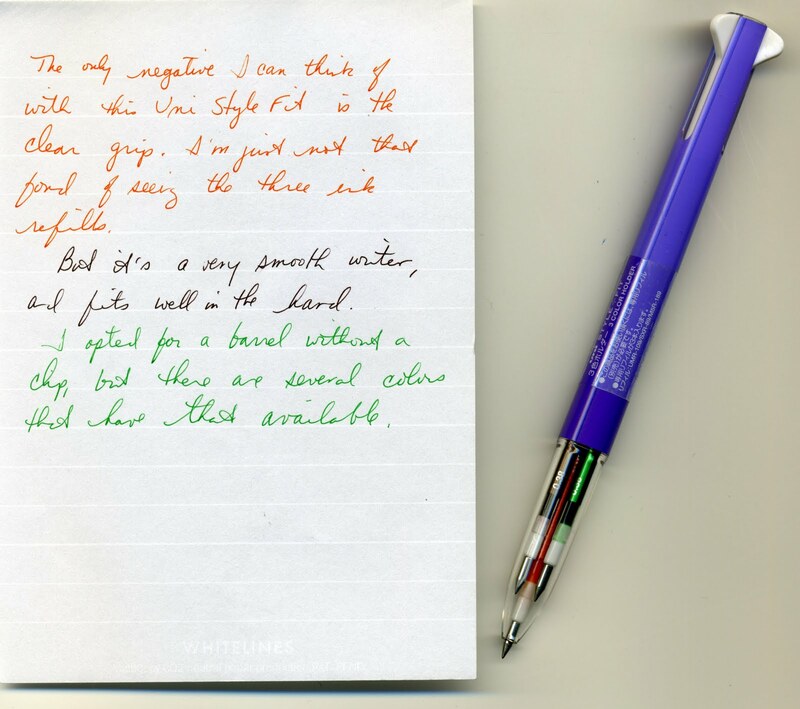 The refills come in a wide variety of shades, and mine is filled with Brown-Black, Mandarin Orange, and a very bright Green all with a 0.38mm tip. Some of the multi-pen barrels have clips, others, like this purple one, do not. 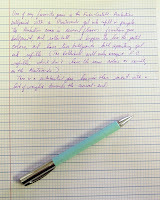 To my eye the pen design isn't particularly stylish, but that may be a combination of the purple color (which isn't as blue as this picture makes it out to be), the "fins" at the end of the barrel, and the clear grip which allows you to see the ink refills but also makes the pen seem...cheap isn't quite the word I'm looking for but perhaps "lesser goods" might be the best way to put it. Which is interesting because the gel ink refills write smoothly and very crisply. This pic isn't the best quality, but the actual writing is very clear, even the green which is paler on the paper than in the pen. It's not a bad multi-pen at all, and I'm thinking of getting a different barrel. What really caught my eye was the Brown-Black ink refill, a different color that I wanted to try and find I like. Seth Grahame-Smith's first work. Pride and Prejudice and Zombies, was a surprise bestseller combining about 85% of the original Jane Austen novel with ultraviolent zombie mayhem. Elizabeth Bennet is a highly-skilled zombie killer, as are her sisters, and it is by this yardstick that she judges Mr. Darcy and initially finds him wanting. There are some memorable scenes, such as when Elizabeth is traveling by foot on her way to aid her sister and is attacked and despatches a number of zombies. After the battle she kneels in a glade in the wood, rear back her head and keens her triumph. Definitely something you'd imagine Jane Austen's contemporaries doing. Now Grahame-Smith has, through a series of unusual events, come into possession of Abraham Lincoln's personal journals. Long suspected but never found, the journals detail Lincoln's life as a vampire hunter (for it was a vampire who killed his mother and ruined his father) and how slavery itself was a means by which vampires were able to thrive in the United States. It is with this knowledge that we have a greater understanding of his actions as President: to rid the country of vampires he first had to rid the country of slavery. 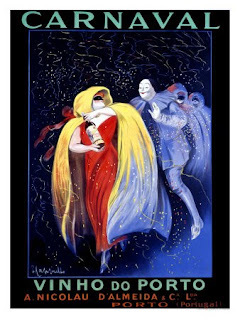 There are many surprise appearances, most notably that of Edgar Poe, and twists and turns--enough to make the book enjoyable although sometimes it takes on the qualities of a bloody laundry list (kill this vampire, kill that vampire, kill another vampire). But on the whole the novel turns vampires on their head, so to speak. Once turned, they take some time getting re-acclimated to sunlight but eventually can walk out in the daytime. Their eyes are black and have no pupil, so they tend to wear dark glasses to cover that flaw. And one drop of their blood can cause people to die (the "milk sickness" supposedly caused by drinking tainted milk), rather than become vampires themselves. Whether one fully buys the Lincoln-vampire-slavery premise or raises a few concerns about trivializing an epic American event (and fiction can only work if one fully suspends disbelief), it is certainly a great mash-up of history and horror. The pictures alone, detailing Abe's life as well as vampire society, are amazingly well-done. There are great reviews of the Zebra Airfit Jell Gel Ink pen, such at the Pen Addict, and now here's a look at the Airfit ballpoint pen. The Airfit ballpoint feels great in the hand and the 0.7mm ink cartridge has one of the smoothest ink releases I've ever felt. It is more like a gel ink pen than a ballpoint, no skips or blotches and the oil-based ink doesn't streak. For a 0.7mm the line is very fine, and the blue ink gets lost on the Doane Paper so that a black ink cartridge might be better. But it's a great looking pen, and the clip opens and closes like an alligator clip so that attaching it to a pocket is easy. I really like the yellow color, as well. JetPens carries the Airfit Gel Ink Pen and Mechanical Pencil but not the Ballpoint Pen. As I'm usually more inclined to use a gel ink I'll be looking at those in different colors. This was an impulse purchase some time back, and while I love the concept I find I don't actually use it very much. With a notebook like this, such as a Rhodia pad, I'm so used to taking the front cover and pulling it behind the back that I can't get used to the Reporter's hard cover. It doesn't have to be flat to take notes, but for some reason I can't get into keeping the cover at a 90 degree angle. In addition, the paper isn't fountain pen ink friendly. So either a pencil or ballpoint, but even a gel ink might bleed through. In the picture to the left you can see the bleed through of an ink swatch I had made. If you like the idea of a Reporter notebook that flips open but doesn't fold then check out the Moleskine brand. I'm quite partial to the Faber-Castell Ambition line, and have already shown off the Ambition fountain pen. The pastel-colored Ambition Ballpen is another favorite, especially after I found out that it will take Monteverde gel ink refills, which include a great blue-black and purple. The barrel is made out of resin and comes in a variety of shades, including tropical blue pictured above as well as mint, lilac, and pink. A detail I like is that the pen retracts by using a swivel motion at the clip end, rather than having a plunger like most ballpoints. On the high-end side for a simple ballpoint pen, but definitely worth is for the way it looks and feels in the hand. From Scott Meyer. While cell phones and Japanese toilet seats are all well and good, a Pilot Namiki 823 Black Demonstrator or all 30 J. Herbin fountain pen inks and a large supply of Rhodia or Clairefontaine notebooks and notepads would be my first choice. I like to keep small notepads on my desk for jotting doodles, notes, comments--whatever strikes me at the time. One of my favorites (besides the Doane Paper small notepad) is the Whitelines Orange Glue A6 notepad, a perfect pocket size (roughly 4 x 6) bite of paper that can handle lots of notes. 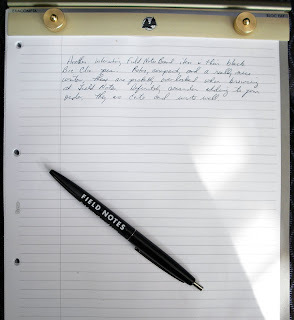 The white lines seem to disappear, but are distinct enough to keep y0ur writing even. My Pilot Precise V7 didn't bleed through this paper, though there was a definite shadow so double-sided writing may not work. The notepads are fairly inexpensive and can round out an Amazon.com order if you're just short of that free shipping minimum. The paper does seem to be easy on the eyes, but for me it's the orange glue that holds the pad together. The BIC Triumph 730R is a refillable rollerball with two point sizes: 0.5mm (extra fine) and 0.7mm (fine). The pen's overall design is modern and sleek, with a tapered black, silver and gray plastic barrel and a pseudo-bejeweled cap. The fine point seems a touch wide, but overall it's a nice writing pen. 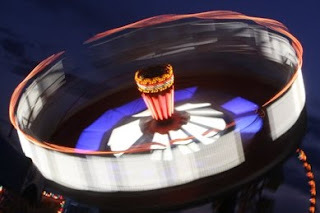 Welcome to the 8th Carnival of Pen, Pencil and Paper, founded by Nifty of Notebook Stories. 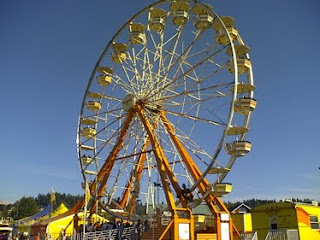 The Carnival highlights posts of interest, amusement, and information through submissions as well as nominations by the editor (in this case, yours truly Pocket Blonde). This month we have lots of great posts encompassing pens, pencils, inks, notebooks, and...other entertainments. Enjoy the reading, and please do invite your friends to drop 'round by posting a link to this website. The 9th Carnival of Pen, Pencil and Paper is scheduled for May 4, 2010, and will hosted by Julie (Okami) of Whatever blog. 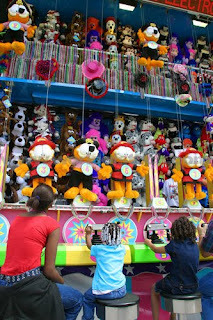 You can submit entries (either your own posts or nominations of other posts) using the Carnival submission form. Leigh Reyes at My Life as a Verb showcases an impressive Nakaya Long Piccolo fountain pen with a roll-stopper that's a show-stopper. Brian at Edison Pen Co. has an in-depth look at steel nibs: a quality modern steel nib will offer virtually everything that a modern gold nib can, with the exception of flex to provide line variation. A morsel of Mont Blancs at My Supply Room, and I wonder if he's got a Pentel Rollerball I could borrow? 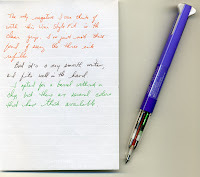 The Amateur Economist reviews the Uni-Ball Jetstream Hybrid Pen. The workhorse of the pen world is the Esterbrook, and Julie (Okami) at Whatever has a nice post featuring an Esterbrook J Double Jewel black fountain pen. Lady Dandelion shows off her Yard-O-Led Retro broad nib fountain pen and 11 inks currently in rotation. The Pen Addict looks at the 0.38mm Muji retractable gel ink pen in orange. A Penchant for Paper takes a look at the Pentel Slicci 10 Colour Set. Grease Monkey Hands reviews the Pilot Falcon II and includes lots of great pictures of the blue one. Bleets at Scriblets has a great post on the Uni-Ball Kuru Toga Mechanical Pencil. Kid Sketches reviews the Paper Mate Write Bros. 0.7mm Mechanical Pencil and Col-Erase pencil. Woodworker at Inkyjournal reviews Rohrer & Klingner Sepia, a dark brown-black ink, and Sheaffer Red, the "perfect" red ink. Clement Dionglay, better known to us as The Archer at Rants of the Archer, has her own take on the best red ink as she reviews the amazing Camel Scarlet Red. And check out her review of Daycraft's Signature Notebook. Over at Everyday Correspondence there's a review of Rohrer & Klingner's Morinda, the color a cross between dried blood and rose red (the perfect ink for Stephen King is he used a fountain pen). Another Rohrer & Klingner ink, Solferino, is a beautiful grape juice color and gets a workout over at Without Ink. Which segues nicely to a post from The Dizzy Pen serving up a wonderful sampler of purple inks. BiffyBeans has hundreds of great ink reviews at her place, Spiritual Evolution of the Bean. This one is for Diamine's Indigo fountain pen ink. And check out her review of the Ecosystem Blank Journal. Journaling Arts reviews Artists Mediums in a Fiorentino Journal Refill (go for the review, stay for the beautiful drawings). A pair of great posts by travisthetrout of Notes in a Book are these reviews of the Quaderno Italiano notebook and the Oxford International Notebook. Margana at Inkophile takes a look at Clairfontaine's French-Ruled notebooks and gives her Namiki Falcon a workout on that wonderful paper. "Clairefontaine paper is outstanding for fountain pens, dip pens and everything in between," she notes. Quite true - a flex nib + Clairfontaine paper= fun! Mark Dykeman of Broadcasting Brain submitted this great post on the insanity of paper notebooks, adding "Some musings about how we use paper notebooks - great comments section." Passion at The Pen Archives offers a wonderful review of the D-Sign Notebook by Daycraft. Daycraft is not available in the US yet, but hopefully these fabulous notebooks and planners from China will find a distributor. A visual diary by d'Blogala (he didn't like the Sharpie pen tattoo?). Speaking of Sharpies as the pen of choice go over to Journals of An Amateur Naturalist for a great post, Capturing Notes in the Field. Over at Quo Vadis Blog there's a competition: Habana v. Webbie v. Moleskine, with film! 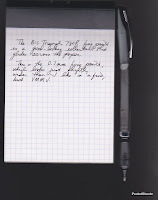 And don't miss OfficeSupplyGeek's thorough review of the Leuchtturm1917 Ruled Notebook. TonyB of Tiger Pens writes: "We love using pens, and what better way to use them than to keep track of the important moments in our lives?" He's put together a great step-by-step guide on how to start writing a journal, and also asks the important question: Do you prefer to take notes with pen and paper or on a computer? Over at Rhodia Drive we get the definitive answer (if we didn't know it before) to the question, "What's the best paper to use with a fountain pen?" Hint: it begins with "R" and is similar in color to a pumpkin, if that helps. Another great post from Quo Vadis Blog, Leah posts about competitive pen spinning (which should really be an Olympic sport). Liz from Life, Love, and Books discovers the joy of buying pens and accessories online, and shows off a JetPens.com order. Totally off-topic, but as I've taken up knitting I thought I'd showcase this amazing Citron shawl that Aimee at StupidHippy completed. The bread looks mouthwatering, too. 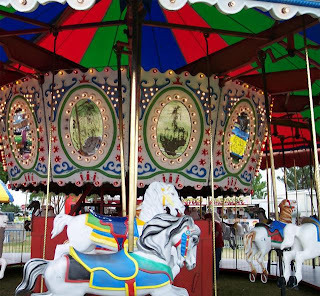 In Nifty's email to me outlining Carnival duties she mentioned something about emails coming my way that aren't related to the topic (a.k.a. "spam"). Why would anyone do that, I thought. Then strange submissions popped up in my mailbox. Poetry? Truck Art? Ranjita patra presents 'That's The Life Baby' - A Perfect Novel for the Young People posted at Breaking News Online. Robert Terrell submitted this poem from The Existential Poet. From Brenda D. Chapman come this post from Construction Management Schools on some amazing trompe l'oeil, 20 Outstanding 3D Truck Art Images. I would love to see that in the US, but oh the accidents (and lawsuits)! Anne Simone submits this post from Online Colleges. net on the 100 Best Places to Appreciate Art6 Online. And Angela Martin submits this post on 80 Awesome Ideas for All Your Old or Unwanted Books from Online Colleges.net. I've gotten to like the Rhodia Reverse Book, a square-shaped (8.25 x 8.25) notebook with graph paper that can be opened in either portrait or landscape format. I've been using it for some of my knitting notes and some lists and ides. You can write in any direction you want, and the notebook has 160 pages of 80gsm extra-white paper. 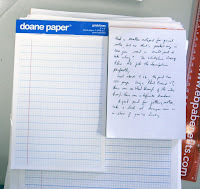 The graph paper can be a bit overwhelming for writing, and so a blank book might be a good option. It's a nice little notebook with an appealing and unusual design. The notebook comes in Rhodia's signature orange and black colors, as well as a metallic cover. Definitely a fun notebook to add to your collection. 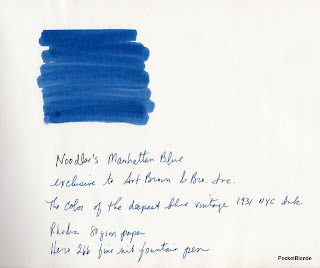 Noodler's Manhattan Blue ink is a rich blue ink based on a vintage 1931 ink used in New York City. It's one of four New York-themed inks exclusive to Art Brown International Pen Shop and is neither bulletproof or eternal but a conventional ink. It's a beautiful color, almost blue-black and there seems to be a very slight hint of green. Another great ink to add to your collection of blues. The Pilot G-Knock retractable gel ink pen is among the new environmentally-friendly office products now on the market. 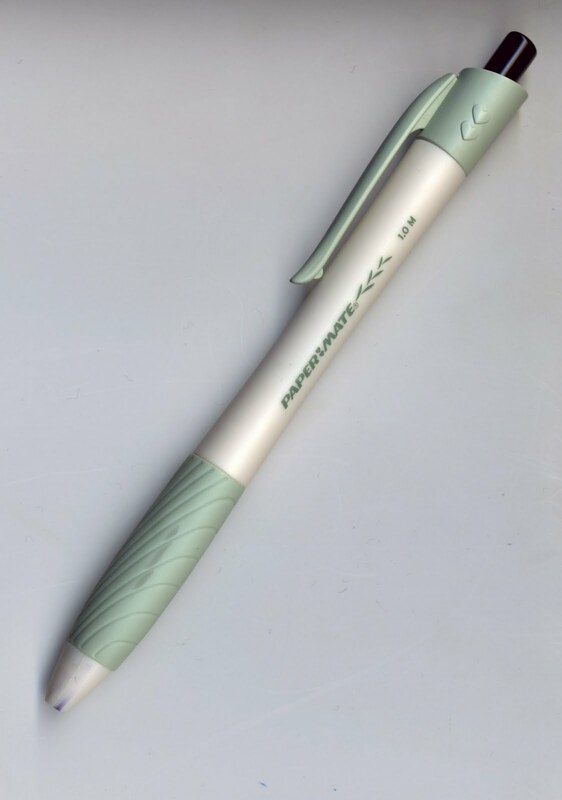 This particular pen is 81% recycled, and is refillable with Pilot G-2 refills. I first got one of these a year or so ago at a vendor fair, and then ordered a box from our office supplier. It's a smooth glider, no problems with skipping at all. The 0.7mm tip is a good size for writing, but depending on the angle of the pen you can make the line thinner or thicker. I love the clear and black plastic barrel of the pen, as the black ink refill has orange shading to it that makes me think of Halloween, black cats, and pumpkins. This is another great Pilot gel ink to try out. 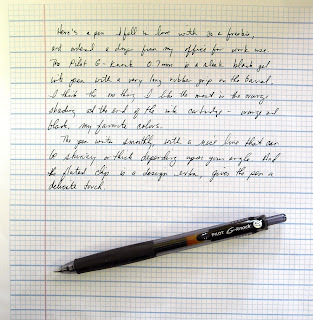 Besides pencils, Field Notes Brand also carries a black Bic Clic pen that's retro and reliable. No smearing or blobs when you write, just nice smooth ink flow. Very sturdy construction and a thick clip that won't break or bend, the plunger is tight gives a very satisfying "click" when pushed. The pens are nicely priced, definitely something to add to your cart next time you're shopping. Here's a really beautiful medium-dark blue, Iroshizuku's Ajisai or Hydrangea. It's a vivid bluish purple as described at JetPens but definitely not as light as the color on the box. I wasn't sure about the color, but Bleets at Scriblets thought I would like the color and he was quite right. As blue goes, it's not a real dark blue and it has just a hint of purple in it to make it interesting. There doesn't seem to be a lot of shading, but I haven't written a lot with this ink so I can't tell yet. But I'm surprised at how bold the ink is using a fine point fountain pen, and will probably ink up my Rotring 900 when I run out of my current ink to see it in a broad cursive italic. Consider adding this to your ink collection if you love blues.